It feels like you could’ve stumbled into, say, Frank Lloyd Wright’s drawing room. 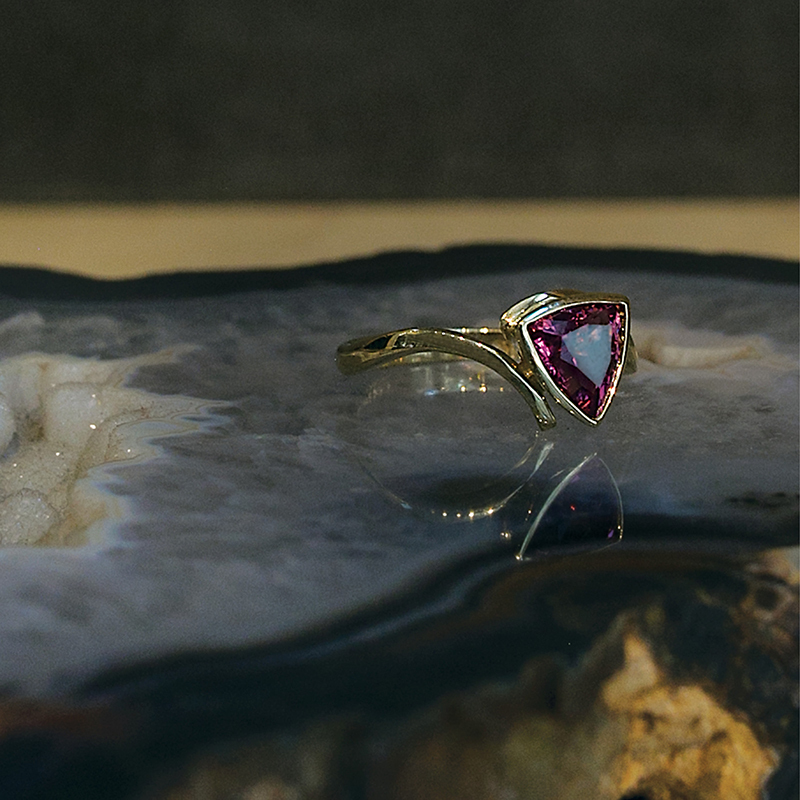 Tucked into a back corner of the nearly three-year-old Corneau Goldsmithing Gallery, just around the corner from Victoria’s Secret on King Street, master-trained goldsmith Michael Corneau’s workspace is from another era. While many custom jewelers use computers and 3-D printing, Corneau hand-draws designs on a 70-year-old oak and cast-iron drafting table before hand-fabricating each piece. A rasberry spinel shines against 18K royal-yellow gold in this ring dreamed up by Corneau. The table actually hails from his previous life as an architect. “I chose architecture because it is a noble profession. People always need a place to live and work,” Corneau explains. Then a landscaping accident in 1997 left him with a thorn through his left eye, and surgeries rendered him unable to continue with his work. He embraced his next interest: gemstones. Serving apprenticeships under master goldsmiths from all over (Laos, Russia, Syria, Poland, and the United States), Corneau also spent six years “learning to judge and evaluate fine gemstones” while working as the head designer and goldsmith for internationally recognized author and gemologist Richard Wise. During that time, he designed numerous pieces that are now included in the Cora N. Miller Collection at the Peabody Museum of Natural History at Yale University. When creating custom designs, “You have to understand simple psychology and people in order to interpret their personality,” he explains. “I take aspects of their personality, and then as an artist, I want to push those aspects a little bit further.” From consultation to reveal, the process typically takes about six weeks, with Corneau drafting multiple designs using gems he’s hand-selected or heirlooms with which customers have entrusted him. 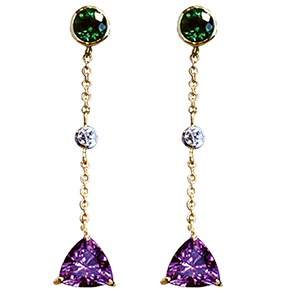 Like the family stones Corneau repurposes into new treasures, custom jewelry-making is his second life, and he’s not looking back. “When they asked Frank Lloyd Wright what his favorite project was, he said, ‘the next one,’” notes the jeweler. 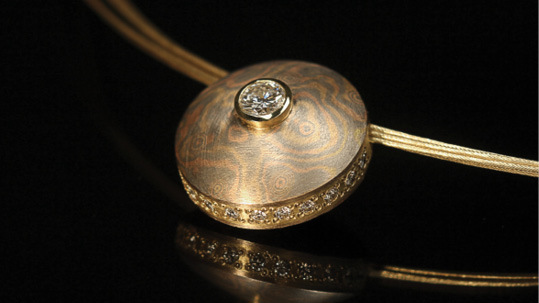 Mokume gane necklace: Corneau used mokume gane—an ancient Japanese technique of metal manipulation that creates a wood-grain pattern—to make an 18K tri-gold pendant (below) with a diamond center and surround. Amethyst brooch: A birthday gift for a client’s mom, it features a 27-carat amethyst from Uruguay cut by award-winning American gem artist John Dyer. “The design originated from the daughter’s love of Art Nouveau; she left the rest up to me,” Corneau notes. Sapphire ring: “A local doctor and I conspired to create a design based on our ability to sneak as much information as possible from his future fiancée without her realizing it,” says Corneau of the 1½-carat blue sapphire from Sri Lanka set in 18K white gold.